Until 1865, the Aboriginal clans of the Dampier Peninsula still had their Law, language and culture intact. However, in that year, the first white settlers arrived with 4.000 sheep. Dispossession commenced. By the beginning of the 20th century, the Djugun and Ngumbarl (clans) had been virtually wiped out. Aboriginal law and custom dictate that, where the tribe is dying out due to disease, etc. or the lack of children, custodial care of the land must be passed over by the remaining Elders to someone who is believed to have capacity to be its custodian. The person is chosen for their qualities, as distinct from their bloodline. Passing of custodianship involves the future custodian being walked through the land and told the names of its key features, the songs in which the names are encoded and the often complex stories of their significance. Holding the songs remains crucial to the capacity to care for the land, for the songs means that the Bugarregarre can be nurtured: the living intelligence of the spirit kept alive through the power of sound. If the custodian (Law-keeper) has this information, they can start at one end of the land and traverse its entire length, reciting the name, song and story of each sacred place. Paddy Roe was born on Roebuck Station, near Broome, just before the First World War. He was brought up there and learned all the skills of working sheep and cattle stations. As a drover he travelled widely in the Kimberley, and then he was contracted for some years as a windmill repairer. In 1931, when Paddy Roe, a Njikina man, entered Jabirr Jabirr land with Pegalilly, his woman, it was inhabited only by 60 to 100 elderly people, including Walmadany, the greatly respected "king" of the remnant Jabirr Jabirr tribe. The young people had been taken away to missions in other places, in accordance with the government's "native" policy. There were no women of child-bearing age. Walmadany and the old law-keepers Narbi and Kardilakan, had been entrusted with full custodianship of the lands of the Ngumbarl and Djugun people, which were overlain by station leases. They maintained the land in the traditional way, in spite of the hazards associated with contact with non-Aboriginal people. Walmadany, Narbi and Kardilakan realised that, without children it would be impossible properly care for this land. Within months of entering the Jabirr Jabirr land, Pegalilly became pregnant. Narbi perceived that the spirit children, who had been waiting the enter herself, but were unable to do so because of her advanced age, had come to life through Pegalily, and that she would have two daughters, whose "rai" ("spirits") had been waiting in the paperbarks of Bindingankun, where she had fallen pregnant. Pegalily and Paddy Roe were taken under the wing of the Jabirr Jabirr people. Mindfull they were all soon to die, the Jabirr Jabirr elders examined Paddy Roe, and walked him through the land many times. He was given full knowledge of the place names, songs and stories of the land, and made Keeper of the Law of the Jabirr Jabirr, Ngumbarl and Djugun peoples. Paddy also learned their languages. He was later to bury many of these people in their Country. 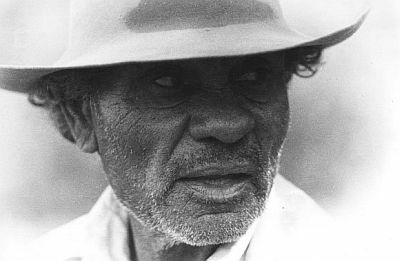 In order to fulfil the responsibility entrusted to him, Paddy Roe settled his family north of Broome and established the Goolarabooloo community. 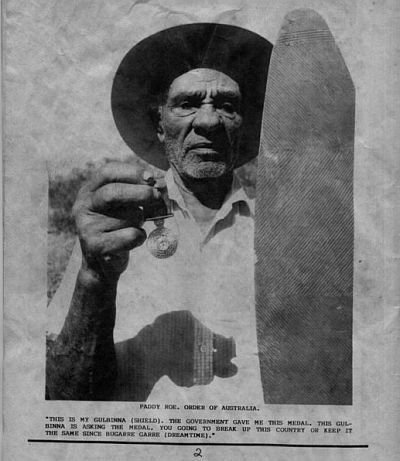 In 1987, he initiated the Lurujarri Heritage Trail as a trigger to encourage the members of the Goolarabooloo community to be walking in the Country again, as had always been done; to conserve, renew and stay connected with their heritage and traditional skills and to keep the same alive for generations to come. He also sought to wake up non-Aboriginal people to a relationship with the land; to foster trust, friendship and empathy between the indigenous community and the wider Australian and International communities. Paddy Roe was a masterful storyteller and many of his stories are recorded in his two books, Gularabulu and Reading the Country, published by the Fremantle Arts Centre Press. Paddy Roe's standing and his work for the community over many decades was recognised in 1990 when the Governor-General awarded him the Order of Australia Medal. He passed away on July 5, 2001. For many, there can be no greater loss than the death of Paddy Roe. A character known far beyond his home country around Broome in Western Australia, Roe was not only respected as an elder holding profound cultural knowledge entrusted to him by his people, but also for his generosity in sharing the "public" aspects of that knowledge with anyone ready to listen. Roe was a storyteller committed to sharing his time with countless visitors to the tamarind tree at his home in Broome. His goodwill and patience grew from his life. This land, and the life it supports, was created at the beginning of time by those of the spirit. This is the Law, Bugarigarre. We, the Aboriginal Law-men, have held this knowledge unbroken since the first people inhabited this earth. Inspired by one of Paddy Roe's books "Reading the Country" (written with Stephen Muecke and artist Krim Benterrak) ABC Radio producer Bill Bunbury went with Paddy Roe to 'read the country' of Roebuck Plains near Broome, Paddy's birthplace. Click here to listen to the interview on the ABC Radio website.